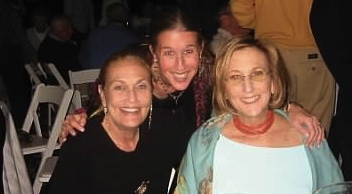 One of the last things that my mother said to me before she slipped into a hepatic coma was that I was lucky to have her sister. I squeezed her hand, nodded in agreement to please her and managed to put a tiny smile on my face. I didn't want her sister, her sister-in law, her friends or anyone else. Living each day in the body of a 30-year-old seemingly high functioning young woman was challenging for me back then as I felt so much more like an ill-behaved, spoiled child. I wanted my mommy. I didn't get my way. My mother lost her long battle with cancer, and I threw a temper tantrum of sorts. I didn't stomp by feet or burst into uncontrollable fits. Instead, I kept my anger bottled up inside. I was mad, sad and I didn't want anyone to make me feel any other way -- especially someone who wasn't my mother. If I couldn't have her, I didn't want anyone else. The problem was though that other people wanted me -- or at least they wanted to help me. My mother's sister quietly (and sometimes not so quietly) supported me every single step of the way. She helped me write the thank you notes for the countless donations in my mother's memory, she helped me clean out all the beautiful clothes in my mother's closet, and then she took me shopping for new beautiful clothes that fit me. Not really knowing what to do with my new baby boy, my mother's sister insisted we take my baby along with us in his car seat and his stroller -- out to the stores, out to lunch, out to wherever we were going. She would not let me sit home alone in my sadness. Neither did my mother's sister-in-law. She invited me, and my family, to her house for dinner. She took me out to Starbucks for a latte and out to the playground for a swing and a snack for my baby. She made it easy for me to talk about my mom even when that was the last thing that I wanted to do. I could tell her anything, cry about it and laugh about it too. My mother's friends called me. I remember the first time I picked up the phone surprised to see the one friend's name pop up on the caller ID. The only times I had ever spoken to this friend on the phone was during my childhood when she'd call to speak to my mom. Those conversations went as far as "how's school" and "can I please speak to your mother." "Sure," I'd say, then throw down the phone letting it hang by its cord as I yelled down the hall for my mom to come pick it up. This time though, I couldn't throw down the phone. The friend was calling to speak to me. She wanted to know how I was doing. She wanted to see if I could join "the girls," as my mother always referred to her group of friends as, for lunch. I was nervous at our first lunch wondering what we'd talk about and if the visit would bring me to tears. That wasn't the case. The friends made it so easy for me asking all about my baby and what I was working on. They told me stories about my mom -- ones that I never knew and ones that I now treasure. My mother-in-law showed up to babysit when I needed her to no questions asked with her baked goods in hand. It may have been a little tricky for her back then, not wanting to step on my toes or the memory of my mother's toes. But I am so glad she showed up and continued to show up time after time. My friends from growing up and from college showed up sometimes when I least expected them to. Sometimes it was under the veiled excuse of "Oh I didn't tell you I had a meeting in Philadelphia?" And sometimes it was all laid out there for me. "I want to come see you." They made the trip to come see me from wherever they were for just a quick visit, a long walk or a familiar hug. They knew I needed to see them even when I didn't know it. New friends came into my life. Curious looking moms who I spotted on the playground and then vetted at the baby music class struck up conversations with me. I responded to them when I felt we had a real connection. One new friend introduced me to a cancer support community where she worked. Another friend encouraged me to write about my sadness. I did. I shared my writing with others and eventually became involved in a whole writing community. It's been well over a decade since these women stepped up to help me when I didn't want it or really maybe didn't know how to ask for it. Their help, their support, their presence, is still never far from me. All these years later, they continue to show up, to make time for a quick check in, an email, a phone call, a walk, a lunch, an extended visit and more. They are not my mother. No one is. But my mother was right. I was lucky to have her sister, her sister-in-law and all of those awesome ladies in my life. Still am.